The Desmond Elliott Prize was founded in 2007 to celebrate the best 1st novel by a new author and to support writers just starting what will be long and glittering careers. It has succeeded in its mission in a manner that would make Elliott proud. The 10-strong longlist for the 12th annual Desmond Elliott Prize, the “UK’s most prestigious award for debut novelists” (Daily Telegraph), has been revealed today (Tuesday 2nd April). The Prize, which is presented in the name of the late, acclaimed literary agent and publisher Desmond Elliott, has revealed a longlist that stretches from magical realism to rigorously researched historical novels and whose authors range from playwrights to political activists. Read the Press Release from the Desmond Elliot Longlist announcement on our Blog. Desmond Elliott’s own story began in an Irish orphanage. In 1947, aged 16 and with just two pounds in his pocket, he left for England to start his publishing career at Macmillan. Thereafter, he set up as an agent and subsequently went on to establish his own publishing company, Arlington Books, in 1960. 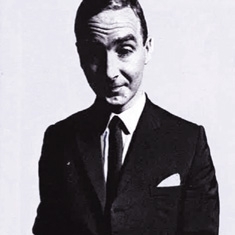 The charismatic, witty and waspish Elliott – who drank only champagne, flew regularly by Concorde and used Fortnum & Mason as his local grocer – nurtured numerous blockbuster authors, including Jilly Cooper, Anthony Horowitz and Penny Vincenzi. He died in August 2003 at the age of 73.